Learn about the 16 extremities of the four main islands, and see why Japan has a whopping 5,503 lighthouses. Find out how a powerful novel and a shipwreck changed Japan and how another shipwreck bonded Japan and Turkey. 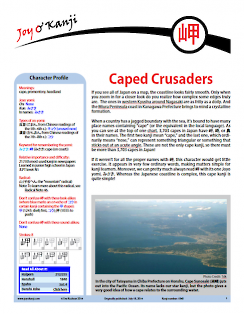 Learn the various kanji for cape names, and see why the 山 radical in 岬 can be a misfit. Discover the locations of coral reefs in Japan and capes in your body! p. 4: Fixed a broken link. p. 10: Changed photo caption so that it no longer says that the restaurant is in Nagasaki. July 31, 2015: p. 10 photo caption: Changed a colon to a comma, defined 開く as "to hold (a party)" instead of just "to hold," changed 揃ろう to 揃う, and added information about the restaurant (i.e., that Masuno's parents own it). July 18, 2014: Originally published.